The Rokko Bridge is so skinny that I would imagine most people used a wider bridge to cross the lake (there are several locations where the bridge is wider to accomodate passing vehicles). The approach settled about a meter but the pile bents held the bridge up (except where they disappeared in the middle of the lake). You can see the new bridge they were building at the time of the earthquake on the right. If you go to Google Earth, you can see that the new bridge now looks complete while the old bridge still is sitting with three spans missing. Maybe the authorities are considering what to do (if anything) about the old bridge. 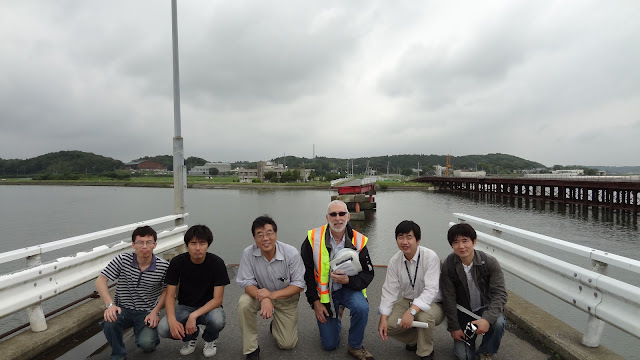 Prof Fujino had us pose in front of the dropped spans for a group photo with his colleagues. It may seem a little strange posing in front of a collapsed bridge, but it took considerable effort for us (especially me) to get to this spot. 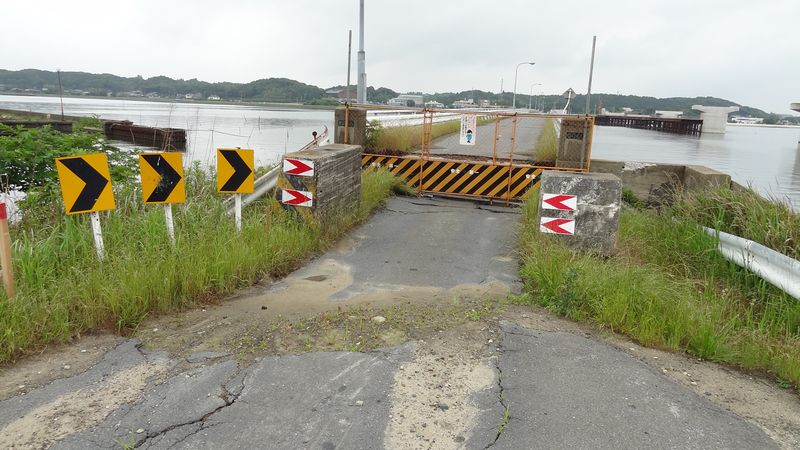 There were only two bridges that collapsed due to ground shaking during the 2011 Tohoku Earthquake and the other bridge was in Fukushima Prefecture (where we weren't allowed to go). Ibaraki, Japan's Bridges: Rokko Bridge across Kitaura Lake (3) by Mark Yashinsky is licensed under a Creative Commons Attribution-NonCommercial-ShareAlike 3.0 United States License.